The Oragene•RNA (RE-100) vial collection kit is changing to a tube format which optimizes collection, transport and extraction. As such, the RE-100 vial format is no longer available for sale. The new Oragene•RNA mailable tube format is currently available and is designed to yield equivalent RNA results to the original RE-100 vial format. Please see the Product Change Notification here. An all-in-one system for the collection, stabilization and transportation of high quality mRNA from saliva. The Oragene•RNA for Expression Analysis Self-Collection Kit is the only all-in-one system for the collection, stabilization and transportation of high quality mRNA from saliva. Download PD-BR-016 – Oragene•RNA (RE-100) data sheet. Instructions for assisted collection using CS-1 / CS-2 saliva sponges. 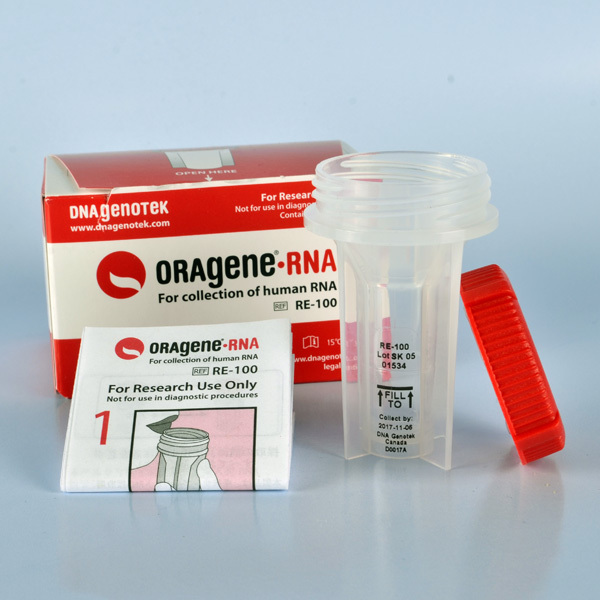 The Oragene•RNA kit is designed for research use only. Not for use in Diagnostic Procedures.